Heat oven to 350°F. Line large rimmed baking pan with cooking parchment paper. Press down center of each baguette slice to make a cup. In small bowl, mix melted butter and garlic. 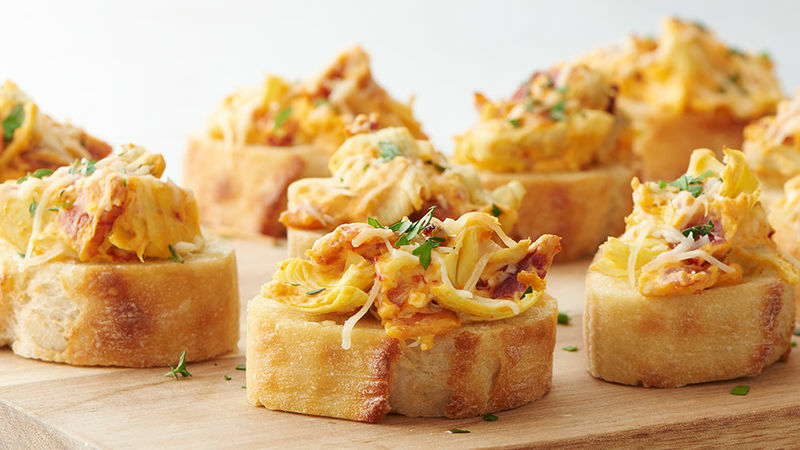 Brush over tops of crostini cups. In medium bowl, mix artichoke hearts, cream cheese, bacon and chili garlic sauce. Spoon into crostini cups. Top with Parmesan cheese. Bake 14 to 16 minutes or until filling is hot and cheese is melted. Transfer to serving platter; top with parsley and thyme. If cream cheese isn’t soft enough to spread with a spatula, place in medium microwavable bowl; microwave uncovered on High in 10-second intervals until spreadable.